I am an amateur photographer (and retired business analyst) living in the UK. I travel the world, meet interesting people, and shoot them. I shoot anything else that moves. I also shoot things that don't move. And if I'm not sure whether or not it moves, I shoot it anyway. I own the copyright to all my images and text on this website. Publishing them on the Internet does not reduce my rights in law. They are not "in the public domain". I grant a limited right to copy thumbnails from this website, or to create and use a thumbnail from part of a page of this website, without explicit permission. This must be for the purpose of providing a link back to the relevant part of this website, as a replacement for, or in addition to, a conventional text link. They must also be accompanied by my name to ensure that it is clear who created the original work. The thumbnail will either link to the same page that the thumbnail would link to here, or to a more generic page, such as one of the galleries. An example of the former use is at Giraffe Central, which uses one of my thumbnails, and many others, in an effective way. I have used this technique myself to link to the websites of other people, always with the intention of directing interested readers to those other websites. This web site is mainly about my my photography (but also about other interests, and my ex business activities). For many years, I took 35mm slides almost exclusively. I scanned them into my PC and processed them with Photoshop. 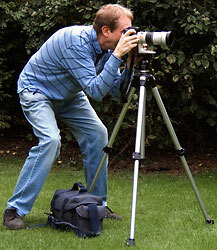 Since about mid-2004, I have been using a digital SLR as well, shooting raw and converting to DNG. I normally don't publish them "straight to the web", but tend to print each photograph first at least at A4 so that I know I have a good quality source file.